One summer, likely when I was about 9, I climbed the privacy fence in our backyard with a neighbor girl named Christine. We had been taking care of a brood of imaginary pet alligators, and we had set out in search of food for them. Just over the fence was a crop of apple trees in the far corner of a large yard. To our delight, the trees were full of bright green apples – exactly what we needed for our hungry pets. Christine and I loaded our arms with as many apples as we could carry and made our way back to my playhouse, where we were keeping the alligators. After several trips that likely yielded many dozens of apples, we heard shouting coming from the house to which the apple trees belonged. To this day, I can still see the old man who came streaking across the yard, yelling as us to get out of his trees. 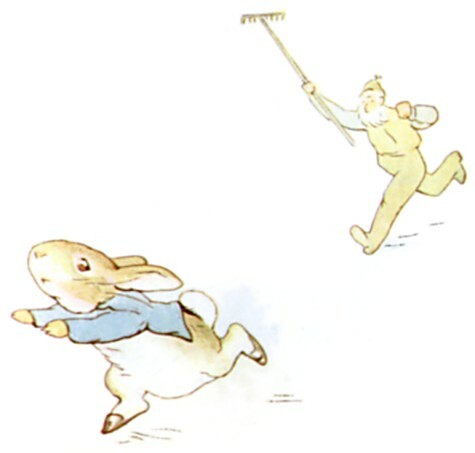 It was an image straight out of Peter Rabbit. Terrified, I scrambled down the branches, but not fast enough. Christine managed to jump the fence and run home, but Mr. McGregor (as I came to think of him) grabbed my arm and dragged me to my back door where he angrily reported my misdeeds to my mother. After Mr. McGregor headed home, my mom made me write him a note of apology. She took me by his house the next afternoon to drop off the note, but I was so terrified he would come running out of his house that I made my younger sister put it in his mailbox for me instead. In all the years that we lived in the house that backed up to Mr. McGregor’s, I never once set foot on his property again. Years later, I ran into an old high school classmate of mine who told me his grandpa had lived behind my childhood home. We connected the dots and it turns out his sweet old grandpa was my “Mr. McGregor” – just an old guy, a little stern, who liked the apple pies his wife made. 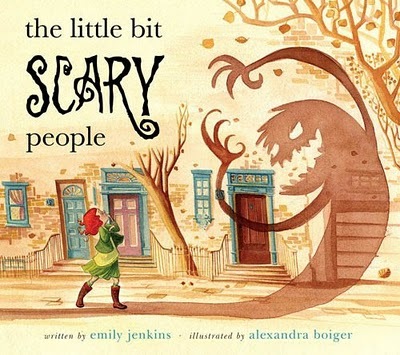 Such misjudgements are the inspiration for Emily Jenkins‘ wonderfully original book, “The Little Bit Scary People.” It’s a story about a shy girl who comes to discover that the many seemingly frightening people she encounters around town and at school might not be so bad after all. The reader first meets the girl’s menacing, mohawked, skateboarding neighbor boy, who “cranks his radio so loud, my dad yells out the window for him to turn it down.” He’s a little bit scary; but with some imagination and the flip of a page, he’s transformed into just another boy who likes to cuddle his cat in the morning and still sleeps with a teddy bear. Similarly, a stern lunch lady is revealed to be an afternoon jogger who listens to show tunes and “sings as loud as she can and doesn’t care if people hear.” And a formidable principal with long, shiny fingernails is discovered to enjoy shaking it loose on the dance floor at night after school. Through the eyes of our redheaded heroine, Jenkins has taught the reader a beautiful lesson in the most subtle way. One comes to realize that intimidating figures of authority and individuals with unusual appearances, once you get to know them, are usually kindhearted people with fun hobbies and families that love them. 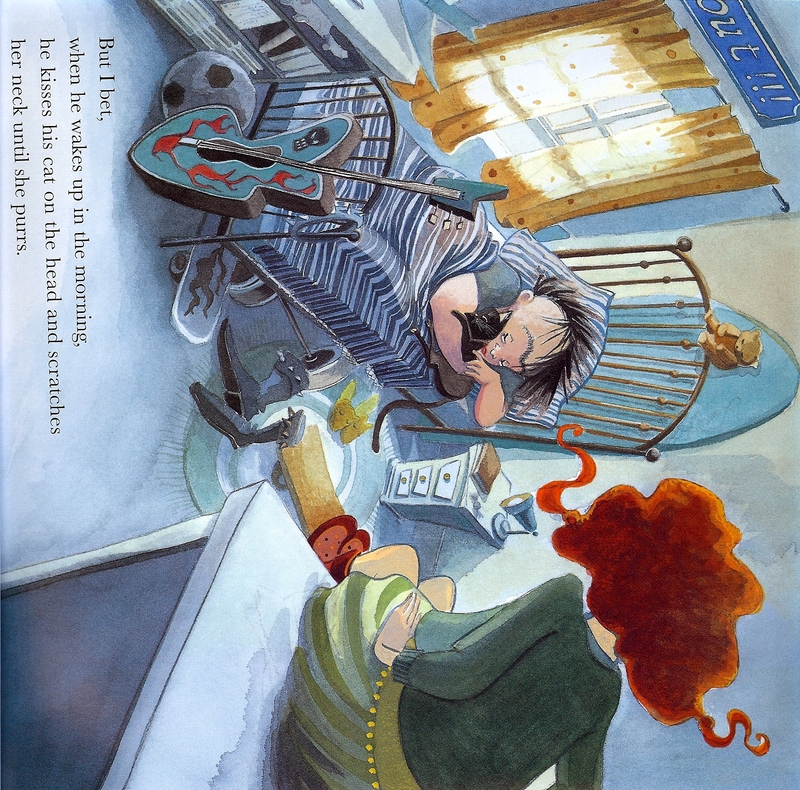 I’m looking forward to getting my hands on another of Jenkins’ books for children: “My Favorite Thing (According to Alberta),” a story about a girl with very particular tastes and a hefty amount of self-esteem. 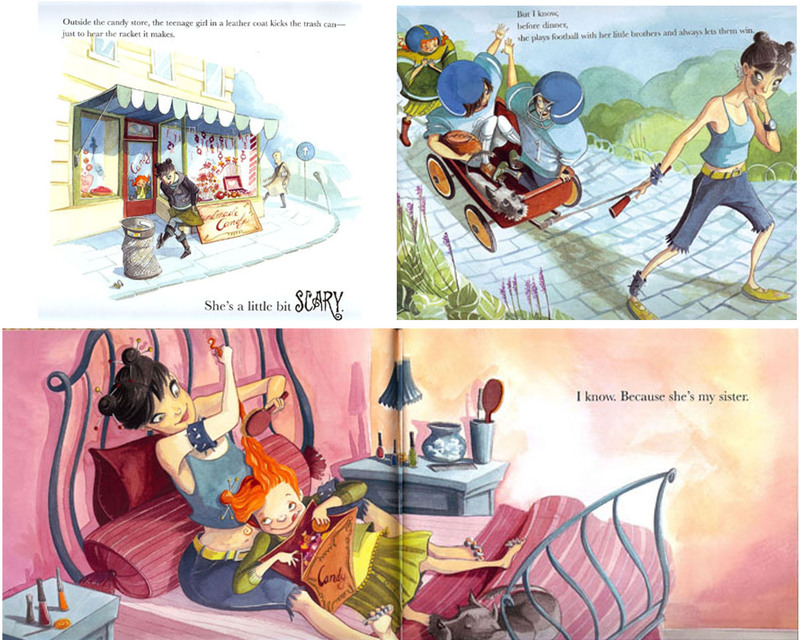 Boiger has also illustrated several interesting books, including the recently released “The Monster Princess,” which takes some of the glitz off of being a princess. And I’m dying to read “Thanks a Lot, Emily Post!,” a story about a mother’s attempt to civilize her children. Love the idea of this book! I’ll have to get the Emily Post one, too…sounds like it’s right up my alley. Bought lots of books for my kids from your recommended list, and the Jolly Postman is on its way to my door! Can’t wait. PS. I’d be glad to buy the Emily Post book! My daughter latched onto this book–the experiences in it seemed so familiar to her and she liked the idea of imagining the softer things a scary person might do at home.